The financial crisis of 2008 had many causes. They ranged from a housing bubble to excessive speculation, and from inadequate accounting rules to reckless corporate governance. But at the heart of the meltdown were the financial industry's distorted incentives — created in large part by decades of misguided government policy — which caused bankers and investors to take enormous risks without due regard for their consequences. The easiest way to make money on Wall Street was (and remains) heavy borrowing and extreme risk-taking. The reason is simple: There has long been a sense — which has only grown stronger over the past year — that the government will step in if the situation gets out of hand. Anyone who runs a large financial institution and makes a huge bet on a loan or investment understands that one of two outcomes is now possible: Either he'll get lucky and make a bundle, or he'll get unlucky and walk away (with Uncle Sam left holding the bag). Why should the titans of finance bother to keep risk in check if the government is going to bail out ruined gamblers? Being judged too important to the economy to fail is a financial institution's one sure bet. I think, actually, what's changed is in the other direction. These banks that were too big to fail are now bigger. Government has sponsored and supported several mergers that made them larger. And that guarantee — that implicit guarantee of moral hazard, the idea that the government is not going to let these banks fail — which was implicit a year ago, it's now explicit. The message to Wall Street has clearly been that large financial institutions are now shielded from the consequences of their own decisions. It is even possible to assign a numerical measurement to this expansion of the "too big to fail" regime. As a recent study by Dean Baker and Travis McArthur showed, the advantages large banks enjoy over small banks have only increased since the crisis. Between 2000 and 2007, large banks (those with assets of more than $100 billion) could borrow money at interest rates that were about 0.29 percentage points lower than those available to smaller banks. In the period since, the spread has grown to 0.49 percentage points. This increased spread is the market's estimate of the benefit of the implicit insurance offered to large banks by the "too big to fail" policy. For the 18 American banks with more than $100 billion each in assets, this advantage corresponds to a roughly $34 billion total subsidy per year. This subsidy distorts the marketplace by hampering the ability of small banks to compete, which in turn leads to greater bank concentration. This increases the power of banks at the expense of depositors and borrowers, and all but ensures that banks will be even bigger the next time a rescue gets called in. In 1998, the Federal Reserve Bank of New York only had to coordinate a rescue of Long Term Capital Management, costing the major creditors $3.6 billion. In 2008, the government had to spend $700 billion to save the whole financial sector. What will we face in 2018 if we don't change course? And yet changing course is far from easy. The government's serial-bailout approach can't just be written off as indulgent folly: In many cases, it has been the most practicable response to very real threats to the financial system, and to the lack of options for assessing and constraining the risks taken by large financial players. But what the Obama administration has proposed as an alternative is hardly an improvement: Its regulatory approach would throw the baby out with the bathwater, preventing American banks from competing and thriving in an attempt to keep their risk-taking in check. What we need now is a better way to judge and restrain that risk, but without placing undue constraints on economic growth and the freedom of the market. Of course, balancing these two crucial yet seemingly divergent aims will be no small feat. If "too big to fail" is so evidently bad, what other options do we have? One approach would be to remove the implicit guarantee given to large banks by making it clear that the government will not step in to protect them should they fail. But such pledges alone would not get us very far, as policymakers in a crisis would be very unlikely to hold to them — and might even be wrong to. The sudden failure of a large bank could in fact be catastrophic for the nation's financial system. And when politicians are faced with catastrophe, long-term concerns tend to take a back seat to the immediate crisis. Another option is to make the alternatives to intervention more palatable. This is the logic behind the Obama administration's proposal that financial institutions prepare so-called "living wills" — contingency plans for how to unwind their obligations in the event of failure at minimal cost to the system. All market players would understand in advance what would be involved in the failure of a particular institution, and it would be clear to all that massive intervention would not be required and, more important, should not be expected. In principle, this is a good idea; in practice, however, every institution would have a strong incentive to sabotage its own "living will" — designing it so that it would fail to protect the system from the shock of the firm's collapse, and so requiring the government to step in and keep the firm afloat. A third option would be to avoid the circumstances that create the need for interventions, by restricting the risks that financial institutions can take. If neither government nor the firms can be relied on to refrain from passing the costs of excessive risk-taking on to the public, then the risk-taking itself should be prevented. This is clearly the best option for changing the behavior of large financial institutions and correcting the distorted incentives that produced such disastrous consequences in the past few years. But everything depends on just how the particular remedy would be carried out in practice. Many proponents of this approach suggest severely restricting the activities in which large financial institutions may engage, in essence radically simplifying the nature and range of permissible transactions. This is what the Obama administration has recently proposed — prohibiting banks from owning, investing in, or advising hedge funds or private-equity funds, and prohibiting proprietary trading with bank funds. Such a policy would be very costly and doomed to fail: very costly because it would require prohibiting the involvement of large financial institutions in an enormous range of financial activities that now allow them to profit and compete; doomed to fail because such regulations are extremely easy to bypass. It takes no time for a clever financier to design a contract that gets around most restrictions. Most important, the 2008 financial crisis was not caused by deposit-taking banks that assumed excessive risk through their proprietary trading desks, but rather by investment banks that took excessive risk in their portfolios and by commercial banks underwriting too many bad real-estate loans. President Obama's proposal would not prevent either of these activities. Instead of restricting particular activities, then, regulators should restrict the total amount of risk that large financial institutions may undertake. In what follows, we propose a means of doing exactly that, while minimizing the burdens of such restrictions on the larger economy. In general terms, this is not a new idea in banking regulation. It is in the spirit of the Basel I and Basel II accords of 1988 and 2004, in which many of the world's central bankers agreed to establish some minimal capital requirements for banks to help safeguard their solvency. But our proposal differs from the Basel approach in two key respects. First, it does not put its faith in the abilities of rating agencies to assess the risks taken by financial institutions, as the Basel accords did. Rating agencies are useful up to a point. But when a change in rating can unleash enormous economic consequences, rating agencies cannot be relied on to make the right call, because they are extremely sensitive to the practical outcomes of their decisions. American International Group was still rated AA two days before it received an $85 billion bailout from the government. Second, our proposal would not place its trust in regulators themselves to act in time, since the incentives they face almost always argue against swift action before a crisis. There is no political payoff for an early intervention, especially given the uncertainty that surrounds all such decisions. After Washington Mutual was taken over in 2008, there were still people complaining that the government acted too early. Preventive banking regulation is something like pre-emptive war: There is no credit for the pain avoided, while there is plenty of blame for the pain inflicted. Experience shows that regulators simply cannot be relied upon to resist these pressures. Any successful mechanism to contain the risks that large financial institutions take, and so to avoid future bailouts, would therefore have to be driven not by refereeing institutions but by the market itself. It would need to rely on the market's ability to collect relevant information promptly, and to make it known widely. How can the market be expected to assess the risks large institutions take if market players know that those institutions will eventually be bailed out in a crunch? The very existence of the "too big to fail" policy makes it extremely difficult for the market to usefully measure and analyze such risks. Fortunately, the logic behind "too big to fail" itself may actually offer a way around this problem. As many observers have noted, the government's reason for bailing out large financial institutions is not exactly that these firms are so large that their failures would crush the whole system. Rather, the government's concern has been that these firms are so interconnected with other financial institutions — through their various transactions, obligations, and contracts — that a default might trigger losses among an enormous number of counterparties, producing further defaults that would cascade out of control. To function properly, the financial system needs to operate under the assumption that certain assets, such as deposits, are "worry free." Depositors with money in, say, checking and savings accounts should not have to monitor counterparty solvency, or worry about which banks their bank is dealing with. This sense of security saves a great deal of anxiety and cost — which ultimately allows the system to operate more efficiently. But this belief can be sustained only if the prompt and full repayment of so-called "sensitive" or "systemically relevant" obligations is not in question. People need to know that not just bank deposits, but also short-term interbank borrowing and the network of derivative contracts, are secure enough that they won't suffer even if their bank collapses. In a system built on trust and confidence, the fundamentals have to be secure to allow people to take sensible risks at the margins. Once we understand that the issue addressed by "too big to fail" is the interconnectedness of large financial institutions, and therefore the stability of the larger system, we can make some important distinctions. Not all of the debt held by large financial institutions, and not all of the transactions they engage in, are systemically relevant in this way, and so in need of such total protection. Specifically, long-term debt is not "systemically relevant." There is no reason for a large financial institution to hold bonds or other long-term debt in other financial institutions. This debt mostly resides in the massive portfolios of mutual funds and pension funds, which can absorb losses in the value of such debt in the same way they absorb losses from equity investments. A default on that debt, therefore, would not trigger a cascade of bank failures the way a default on short-term debt could. Our proposal, then, is for a new system of regulation that protects the systemically relevant obligations of large financial institutions — making sure they would be repaid by the institution (not by taxpayers) in the case of bankruptcy — but leaves open the possibility that non-systemically relevant obligations will not be protected. Under this new system, banks would be required to hold two layers of capital to protect their systemically relevant obligations. The first layer would be basic equity — not much different from today's standard capital requirement, except for the fact that the amount of equity required would be determined not by an accounting formula, but by a market assessment of the risk contained in the second layer. That second layer would consist of so-called "junior long-term debt." Being explicitly labeled "junior" means this debt would be repaid only after the institution has made good on its other debt, and so also means that it would involve more risk for those who buy it (therefore offering higher rates of return). Such debt would provide an added layer of protection to basic equity because, in the event the institution defaulted, the junior long-term debt could be paid back only after other (more systemically relevant) obligations have been repaid. Perhaps most important, because this layer of debt would be traded without the assumption that it would always be protected by federal bailouts, it would make possible a genuine market assessment of its value and risk — and therefore of those of the financial institution itself. This is the crucial innovation of the approach we propose. The required second layer of capital would allow for a market-based trigger to signal that a firm's equity cushion is thinning, that its long-term debt is potentially in danger, and therefore that the financial institution is taking on too much risk. If that warning mechanism provides accurate signals, and if the regulator intervenes in time, even the junior long-term debt will be paid in full. If either of these two conditions is not met, the institution may burn through some of the junior-debt layer — but its systemically relevant obligations will generally still be secure. In this case, the firm may suffer, but the larger financial system will be kept safe. This remedy would work more or less as a margin-call system does in the stock market. When an investor buys stocks on margin, he puts down only part of the cost; as a result, he must show that he has enough collateral to cover the risk his broker is taking in lending him the money to make up the difference. If the stock price drops below an agreed-upon level, that risk increases. The broker then issues a "margin call" — which means the buyer must either provide additional collateral or sell his stocks to pay back the broker in full. The system of financial regulation we are proposing would treat large banks the same way: They would have to show the regulator that they have enough collateral (in the form of equity) to ensure that all of their debt — not just the systemically relevant part — could be paid in full. And if declines in the value of their underlying assets put the banks' debt at greater risk, they would face a kind of margin call from the regulator, forcing them to either post additional capital or submit to liquidation — allowing their debt to be repaid either way. The success of this system rests, of course, on the timely intervention of the regulator tasked with making that "margin call." If the intervention were too slow in coming, the bank's long-term creditors could be at risk (though as long as the delay was not too severe, the systemic obligations would still be shielded). Thus, it is essential to have an effective mechanism that assesses risk and triggers a response — operating as both a warning to the regulator and a means of compelling him to act swiftly. In a normal margin account, a broker considers the total value of the investment — which is easily determined, since all assets are traded — and compares the value of the collateral his client has posted with the likely risk of loss. If the collateral is insufficient to cover a plausible decline in the stock's value, he calls for more collateral. In the system we propose, of course, the value of the "investments" (that is, the value of the financial institution's assets) is not as easy to determine, because the assets — commercial loans and home-equity lines, for example — are not standardized and not frequently traded; they do not have a clear price. It is therefore difficult to tell when the equity the bank has posted is too thin to protect the existing debt — and so difficult to know when the bank has taken on too much risk. In addition, debt holders are often dispersed, and incapable of coordinating a margin call. If a margin-call approach is to be followed, then, it requires an easily observable, automatic trigger. Ideally, such a trigger would be market based — i.e., tied to the price of some traded security. This means it would incorporate and reflect all the information available in the market, which traders gather because it is profitable for them to know it. The breadth and diversity of the market also mean that such a signal would be hard to corrupt, and not subject to political pressures like those that can be focused upon a single credit-rating agency or government regulator. To avoid unnecessary fluctuations and false alarms, the trigger should also be a security traded in a market with a lot of liquidity, and therefore stability. And its price should be closely linked to the financial event we want information about: in this case, the fact that an institution's long-term debt is at risk. Equity prices, for instance, fail to satisfy this final criterion. As long as there is the possibility of a significant upside, equity prices will stay relatively high even when the company is close to bankruptcy and the debt is at risk of not being paid in full. The price of the junior long-term debt would be a better place to look. When the equity cushion is running thin, that long-term debt becomes endangered and will start trading below par. This option, though, fails to meet another criterion: The bond market, where such debt might be traded, is highly segmented and illiquid; bond prices are therefore unreliable signals. Since a CDS is basically a bet on the odds of a particular firm's failure, the CDS price reflects the market's assessment of how likely it is that the firm's debt will not be repaid in full. It thus offers exactly the instrument we seek. Under our system, the CDS price for a bank's long-term debt would be used to gauge the risk of the equity cushion's being devoured by losses. If the CDS price were to rise above a critical threshold — thereby flagging imminent danger — the regulator would force the institution in question to issue equity (that is, to offer new stock for sale) until the CDS price moved back below the threshold. If the price did not fall below that threshold within a predetermined period of time, the regulator would intervene. Credit default swaps have developed a bad reputation lately, as they are often cited as one of the causes of the financial crisis. The problem, though, was not with credit default swaps as such, but with the way they were traded. To profit from the higher margins available in an opaque market, large banks lobbied heavily against requiring credit default swaps to be traded in an open exchange and to be properly collateralized. A seller in the futures market, for instance, has to update his collateral position daily, which protects the buyer against the risk of the seller's default. But the CDS market before the crisis required no such protections — allowing AIG, for example, to sell enormous amounts of "insurance" without posting the proper collateral. When the risk increased and the buyers asked for the collateral, AIG had to be rescued. So credit default swaps are not bad per se; they can be dangerous only to the extent that they are not properly collateralized. When traded in an organized exchange, the CDS is a very useful instrument for reducing the exposure to credit risk — and its price offers just the signal upon which our system relies. Fortunately, there is now a clear trend toward moving credit default swaps onto exchanges, which will naturally require better collateralization to protect the exchanges' members. Thus it seems likely that CDS prices will become increasingly reliable. Another benefit of this transparent, market-based signal is that it helps to address two major risks posed by regulatory intervention in the financial system. One is that a regulator could arbitrarily close down well-functioning financial institutions for political reasons. The other is that a regulator, under intense lobbying by the regulated, can be too soft — a phenomenon known in the banking literature as "regulatory forbearance" (and a contributing factor to the 2008 crisis). Our mechanism removes most of the regulator's discretion to make either error: The regulator cannot intervene if market prices do not signal distress, and yet it would be difficult for the regulator to avoid intervening when the market does signal — to everyone — that a firm is in trouble. As added incentive, we would allow bondholders in a regulated institution to sue the regulator if the trigger were clearly set off without any action being taken. Since the required subsequent intervention would stabilize the value of the bonds, bondholders would have a legitimate cause of action. And just what form should the regulator's intervention take? Here, too, we think the presence of a market-based trigger for action makes it possible to adopt targeted, prudent measures that avert both overreaction and under-response. If the trigger were to be set off by a too-high CDS price, the regulator would be required to carry out a "stress test" on the financial institution to determine if it is indeed at risk. In a stress test, regulators use sophisticated algorithms to run "what if" scenarios that examine whether a financial institution has sufficient assets to survive serious financial shocks. A stress test should precede any other action, so that extraneous panic is not allowed to bring down financial institutions unnecessarily. If, for instance, a few significant hedge funds or other investors lost confidence in a bank on the basis of a rumor or misperception about its strength, and began to buy credit default swaps as protection against its failure, the CDS price would rise and might trigger regulatory action. It is important that the regulator first test the validity of the concern before acting on it. If the bank passed the test and showed the regulator that the CDS price was not accurate, the regulator would then declare the company adequately capitalized. But if the bank failed the test, the debt was found to be at risk, and issuing equity did not improve its situation, the regulator would replace the institution's CEO with a receiver or trustee. This person would be required to recapitalize and sell the company, guaranteeing in the process that shareholders were wiped out and creditors — while not wiped out — received a "haircut," meaning that the value of what they were owed would be reduced by some set percentage. That haircut is crucial in ensuring that the market prices credit default swaps in a way that takes regulator interventions seriously — showing that creditors will pay a price for an institution's failure — and so makes the trigger more reliable. This regulatory receivership would be similar to a mild form of bankruptcy. But while it would achieve the chief goals of bankruptcy — imposing discipline on investors and management — it would avoid bankruptcy's worst cost: the possibility that one firm's failure could take down the entire financial system. A potential risk of this proposal is that the news that a regulator is performing a stress test on a bank might scare off the short-term creditors and induce a run on the bank. This problem can easily be fixed by having the regulator temporarily guarantee the bank's senior debt for the brief period of the stress test itself. With our early-warning system and double layer of protection, the systemic obligations (which in our mechanism are all "senior" debt) will essentially always be paid. So the government is not assuming real risk; it is only defusing the risk of a run. This guarantee can then be lifted when the bank is deemed well capitalized (and more junior debt is issued) or, if the bank is put into receivership, when it emerges from receivership. In addition to setting out the conceptual case for the trigger and the form of intervention, putting this approach into practice requires us to specify two parameters: the particular size of the junior-debt cushion financial institutions should be required to have, and the particular threshold CDS price for triggering regulatory action. The best way to estimate both is to try to apply our proposal to the financial crisis of 2008. When we do, the first thing we learn is that the CDS rate is in fact a powerful predictor of the fate of large financial institutions in a crisis. Table 1 shows the one-year CDS rates for the nation's largest financial institutions throughout the crisis in basis points per year. (A CDS rate of 11 basis points means that it costs $11 to insure a $10,000 debt against default for a year.) The dates we have chosen are what is now taken to be approximately the beginning of the crisis, the end of 2007, the date of the rescue of Bear Stearns, and the date the initial TARP proposal was rejected by Congress. While it is true that the CDS market did not anticipate any problem until the summer of 2007, after that point the market provided a remarkably accurate indicator of the eventual fate of the major financial institutions. As the table makes clear, the market early on singled out Washington Mutual and Bear Stearns as the two most problematic institutions. In fact, if one had to predict in August 2007 the five institutions that would go under first on the basis of their CDS rates, one would be correct in four out of five cases. By the end of 2007, the data showed a decisive worsening of the situations of the investment banks and Washington Mutual. In late December, the market put the probability of Washington Mutual's defaulting within a year at 10%. By March 2008, that estimate had risen to 30% — and yet the regulator waited until September 25 to take over the bank. This history of the crisis read through the lens of CDS rates can also help us see approximately where and when the CDS-rate trigger should be set. If our goal is to intervene between, say, six and nine months in advance of a genuine failure, we can go back and see how high the CDS rates of failed institutions were six to nine months before the failures occurred. We can then determine the false positive rate by looking at how many stable institutions the trigger mechanism would have flagged as questionable. Table 2 presents a one-month average of one-year CDS rates six months and nine months before the "failures" of major institutions. We use failure here loosely, because Bear Stearns, Merrill Lynch, AIG, and Citigroup did not fail — they were of course rescued by the government, either through a shotgun wedding or a direct taxpayer bailout. The classification "surviving" is also open to debate, since Goldman Sachs and Morgan Stanley could also be said to have been saved by the government. But these labels generally correspond to how the practical fate of these institutions has been understood. 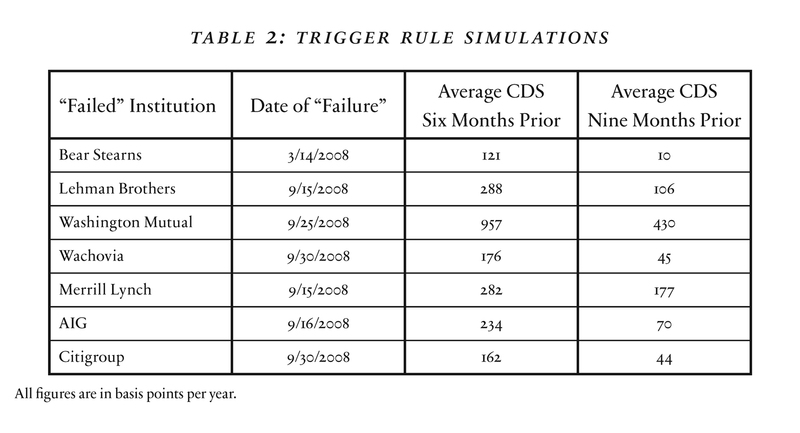 As the table demonstrates, all the "failed" institutions had CDS rates above 100 basis points six months before collapsing; only Lehman Brothers and Washington Mutual had CDS rates above 100 nine months before they went under. With the exception of Bear Stearns, though, all of the institutions had CDS rates above 40 nine months before their respective failures. In Table 3 we look at the false positives; that is, when the institutions that did not fail would have first set off our market-based trigger. For the commercial banks — Bank of America, J.P. Morgan Chase, and Wells Fargo — the 100 basis points threshold would have been only after the Lehman failure that sent the financial industry into a panic. For the two investment banks — Goldman Sachs and Morgan Stanley — it would have been crossed in February 2008 and in November 2007, respectively. It is unclear, though, whether these are really false positives: One could easily argue in retrospect that these two institutions did in fact need more capital back then. The 40 basis points threshold, by contrast, definitely seems to generate too many false positives — since it would have triggered an intervention in Wells Fargo back in November 2007. A trigger at 100 basis points therefore seems roughly appropriate. With the benefit of this information, we can also consider the appropriate size of the junior-debt cushion. Given our trigger rule and the potential delays in a regulator's response, the junior-debt layer should be thick enough to fully protect the systemically relevant debt. Suppose we wanted to make sure each institution had a sufficient cushion to endure a delay of six months: It would be reasonable for us to set the rules such that after an institution has exhausted its equity layer, the probability of its running through the junior-debt layer in six months is less than 5%. If asset volatility is around 8% per year, our calculations suggest that maintaining a layer of junior long-term debt worth roughly 11% of assets will offer the necessary protection. By today's standards, this figure is hardly high: For the eight largest banks, the long-term debt-to-asset ratio in September 2008 was 19%. A new regulatory system that required a CDS rate below 100 and a long-term debt layer of at least 11% would therefore not be a great burden for the major banks today. The key to our proposal is not the toughness of the initial rules, but rather the promptness of the corrective action triggered by a market signal. This lack of a harsh crackdown means the transition to our system would be relatively painless for the banks. Our approach would also have several other significant advantages over today's regulatory system, not to mention most of the ideas for reform now being proposed and debated. For one thing, it would be quite simple, and not very different from the system of capital requirements currently in place. Second, it would be easily applicable to diverse financial institutions — such as hedge funds and insurance companies, as well as banks — if policymakers wanted to expand its reach. Many mechanisms designed explicitly for banks would be difficult to adapt to other financial institutions, but our system is based on three simple concepts that are easily portable: an equity cushion, a junior-debt cushion, and a CDS trigger. Third, this approach would overcome the natural tendency of regulators to forbear by introducing a trigger determined not by one person but by the whole market. Last, but surely not least, our mechanism would not rely on significant amounts of taxpayer money. The financial crisis of 2008 resulted from a series of misguided policies, failures of regulation, and missed signals. Unfortunately, much of the conversation about regulatory reform since has revolved around ideas that would only extend and exacerbate all three. Even worse, the actions taken in the aftermath of the crisis — and the remedies now being proposed — seem likely to further solidify the dangerous perception that some institutions are just too big to fail. That perception dulls competition and distorts the allocation of capital — favoring excessive risk-taking, and sowing the field for the next crisis. What we need instead is a means of curbing reckless risk-taking, and especially the incentives that drive it, while making sure not to unduly constrain economic activity, investment, and growth. The combination of a new capital requirement for large financial institutions with a new market trigger for regulatory action would offer just that balance. It could be introduced today without causing any serious hardship to financial institutions or the larger economy, without costing taxpayers much (if anything at all), and without requiring much in the way of new legislation. Our proposal would also offer a means of averting future bailouts, of re-establishing some confidence and order in the system, and of allowing once again for genuine competition in the world of finance. It would offer an opportunity to apply the lessons of the financial crisis without overreacting — and, most important, to protect the dynamism of American capitalism without neglecting the government's responsibility to protect the American public. Oliver Hart is the Andrew E. Furer Professor of Economics at Harvard University. Luigi Zingales is the Robert C. McCormack Professor of Entrepreneurship and Finance at the University of Chicago Booth School of Business.